To measure the value of manufacturer payments into the system, we rely on IQVIA’s excellent new Medicine Use and Spending in the U.S.: A Review of 2017 and Outlook to 2022. It’s a valuable report that is full of fact-based insights about U.S. pharmaceuticals. First, some background on terminology. A pharmaceutical manufacturer’s gross revenues equal its revenues from sales at a drug’s Wholesale Acquisition Cost (WAC) list price. Net revenues equal the actual revenues received by the manufacturer. The IQVIA report analyzes manufacturers’ net revenues. IQVIA computes this figure by estimating the total value of rebates, off-invoice discounts, copay assistance, price concessions, and such other reductions as distribution fees, product returns, discounts from the 340B Drug Pricing Program, and more. These factors constitute the total gross-to-net difference between a manufacturer’s gross and net revenues. We estimate that negotiated and statutory rebates, however, are the largest and most significant components of gross-to-net differences. Confusingly, IQVIA refers to manufacturers’ net revenues as “net price spending,” though the figures are not equivalent to third-party payers’ or patients’ spending. IQVIA briefly notes this fact in its report, but I believe that many people misunderstand the reported figures. IQVIA uses the terms spending on medicines and invoice-price spending to refer to the amounts paid to distributors by their pharmacy or hospital customers, including prompt-payment and volume discounts. 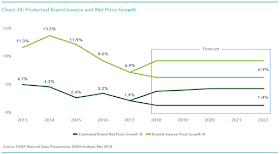 IQVIA notes, however, that invoice prices “do not reflect the off-invoice discounts and rebates separately paid to insurers, or other price concessions paid to patients or other health system participants.” The IQVIA report shows the total invoice-to-net reduction, but not the total gross-to-net reduction. IQVIA defines protected brands as drugs with patent protection that have been on the market for at least two years. In the report, IQVIA distinguished these products from new brands. Certain data are reported only for protected brands. For more background, see Section 5.3. of our 2018 Economic Report on U.S. Pharmacies and Pharmacy Benefit Managers. Here are our three observations on the latest IQVIA data. 1) Brand-name manufacturers earned substantially less revenue than drug list prices imply. IQVIA estimates that in 2017, pharmaceutical manufacturers received only 56% of the list price of protected brand-name drugs. In other words, gross-to-net reductions lowered revenues at list prices by 44%. (See page 44 of the IQVIA report.) This figure is consistent with the public disclosures made by three of the largest pharmaceutical manufacturers. See Payer Power: Why Eli Lilly, Janssen, and Merck Deeply Discount Their Drug Prices . The three companies reported average discounts from list prices of 42% to 51%. The IQVIA data explain why you should ignore the many bogus studies of drugs’ list prices. Politicians love to bloviate about list prices, but those figures clearly do not reflect what drug makers earn. IQVIA provided Drug Channels with unpublished data on the total gross and net sales of protected and new brand-name drugs. 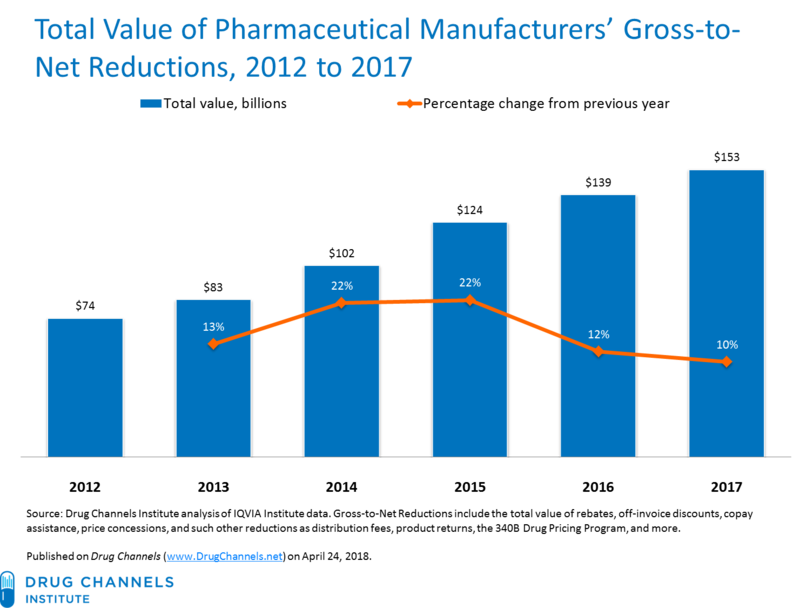 Using these data, we computed that in 2017, total gross-to-net reductions for brand-name drugs were a whopping $153 billion. As the chart below shows, that figure has more than doubled over the past five years. IQVIA reported that the total invoice-to-net reduction for all products (not just brands) was $128.2 billion in 2017. That figure was lower than the gross-to-net reduction, because invoice prices are lower than list (gross) prices. Similarly, our previous analysis underestimated the total value of manufacturers’ rebates and discounts, because we had reported the invoice-to-net reduction rather than the full gross-to-net reduction. 2) The gap between invoice and list prices narrowed in 2017, though the gross-to-net bubble still expanded. The growth in rebates and other discounts means that manufacturers have been experiencing more limited growth in net prices than the growth in brand-name drugs’ list prices. IQVIA doesn’t report changes in list prices. It does, however, report changes in invoice prices. For brand-name drugs, changes in invoice and list prices are highly correlated. The chart below shows invoice and net price changes for brand-name products that are more than two years old and have not yet faced generic competition. In 2017, invoice prices grew by 6.9%, but net prices grew by only 1.9%. 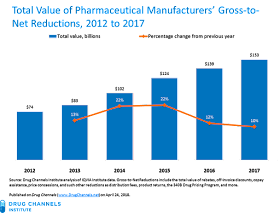 The slow growth in drug costs is consistent with the data that I discussed in New Express Scripts Data: The Drug Spending Slowdown Is Real. (I’ll be covering the other PBMs’ drug trend report in May.) I summarized the key factors behind the gross-to-net disparities in my article about payer power. Though the gap between invoice and net prices narrowed in 2017, the total value of manufacturers’ gross-to-net reductions grew by 10%, from $139 billion to $153 billion. 3) Brand-name drug list prices are growing more slowly. The IQVIA data also confirm that brand-name drug list prices have been increasing more slowly. Prior to 2015, growth in list and invoice prices had been increasing by 10% to 15%. Since then, list price growth has slowed. Such manufacturers as AbbVie, Allergan, and Novo Nordisk have announced plans to keep brand-name drug list price increases below 10% annually. 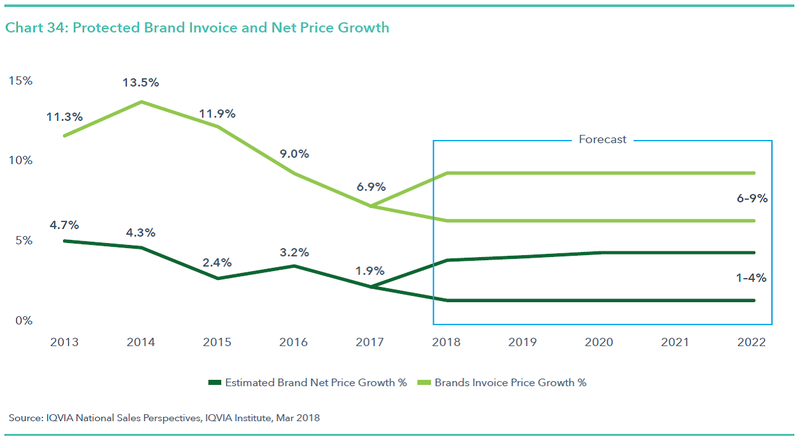 IQVIA expects that from 2018 to 2022, invoice price growth for brand-name drugs will range from 6% to 9% and net price growth to be 1% to 4%. “I’m encouraged by the actions taken by some of your members to help patients, prescribers, and pharmacists identify more affordable medicines at the point of care. 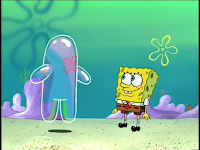 Like Mr. Squarepants, we are all ready for a reset of the current drug channel system.